← Now wash your hands! It may seem a bit tasteless but we have to admit that cancer’s a very ‘trendy’ field. That is, there’s always a current fad — something for which either the media or cancer scientists themselves have the hots. Inevitable I suppose, given the importance of cancer to pretty well everyone and the fact that something’s always happening. If you had to pick the front-running trends of late I guess most of us might go for ‘personalized medicine’ and ‘immunotherapy.’ The first means tailoring treatment to the individual patient, the second is boosting the innate power of the immune system to fight cancer. Few things are trendier than this blog so it goes without saying that we’ve done endless pieces on these topics (e.g. Fantastic Stuff, Outsourcing the Immune Response, Self-Help – Part 2, bla, bla, bla). How considerate then of Krijn Dijkstra, Hans Clevers, Emile Voest and colleagues from the Netherlands Cancer Institute to have neatly combined the two in their recent paper. What they did was did was easy — in principle. They grew fresh tumour tissue from patients in dishes in the laboratory. Although it doesn’t work every time, most of the main types of cancer have been grown in this way to give 3D cultures called tumour organoids — tumours-in-a-dish. That’s the ‘personalized’ bit. Then they took blood from the patient and grew the lymphocytes therein in a dish to expand the T cells that were specific for the patient’s tumour. That’s the ‘‘immuno’ bit. Growing tumour tissue (from non-small-cell lung cancer (NSCLC) and colorectal cancers [CRC] in culture as tumour organoids. This permits the expansion of T cells from peripheral blood to give an enlarged population of cells that will kill those tumours. From Dijkstra et al. 2018. 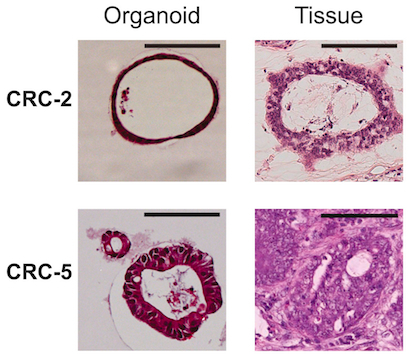 They were able to show that enriched populations of tumour-reactive T cells could kill tumour organoids and, importantly, that organoids formed from healthy tissue were not attacked by these T cells. Stained organoids (left) and original tissue (right) from two colorectal cancers (CRC-2 & CRC-5) showing how the organoids grow to have an architecture similar to the original tumour. From Dijkstra et al. 2018. Their method worked for both bowel tumours and non-small-cell lung cancer but there’s no reason to suppose it can’t be extended to other types of cancer. Some of their videos showing tumour organoids being chomped up by enriched killer T cells are quite dramatic. Cells labelled green that can be seen in this video are dying. So there you have it: DIY tumour therapy! 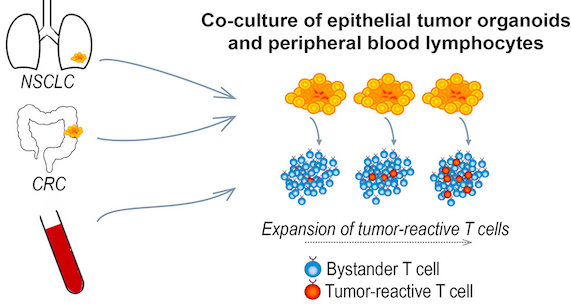 by Co-culture of Peripheral Blood Lymphocytes and Tumor Organoids. Cell 174, 1–13.